The physical Duncan Float venue is shown below. 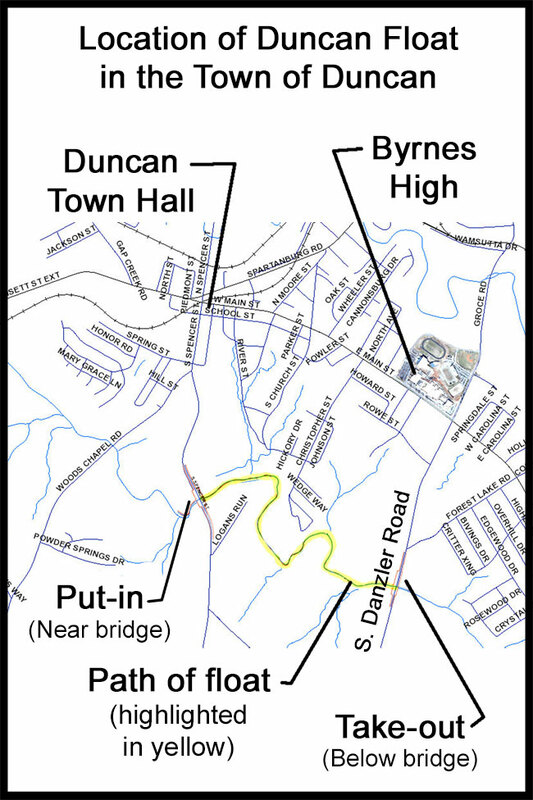 It consists of a put-in at the South Spencer Street Bridge, the stretch of the South Tyger River highlighted in yellow and the take-out at the South Danzler Road Bridge. The physical venue will be controlled the Tyger River Foundation since they own the put-in and take-out. Currently the gates are closed. The Tyger River Foundation hasn’t finalized a gate policy yet. When they have one it will be posted here. The general location of the float in the Town of Duncan is shown below. The put-in and take-out have room for parking and of course provide access to the river. The take-out has a nature walk that should interest children and adults alike. The short video below is proof that a person can indeed float down the South Tyger River. A much longer video of the same float shown above can be seen by clicking here. The longer video was made to help people get an idea of the number of obstacles that have to be removed. Fortunately to get the Duncan Float both tube and kayak friendly is not near as daunting as one might think from the video. Many obstacles can be navigated around. However the ultimate goal would be to get the physical part of the Duncan Float family friendly. This would require clearing out most every obstacle in the main channel. After this is accomplished the vision is to have the Town of Duncan organize some events including food and fun. 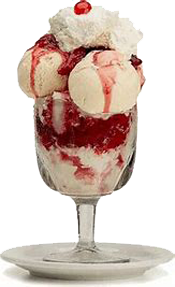 It has been proposed that part of the food should be a “Duncan Float.” This would be an ice cream float to go along with the float. 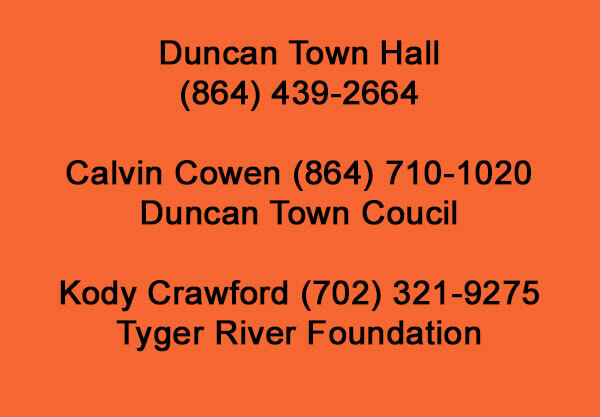 The good news for the Town of Duncan is that the Duncan Float will be extremely low cost to the Town. The Tyger River Foundation has already taken care of constructing the put-in and take-out which is the main cost of the project. A huge thank you goes out to them. A huge thank you also goes out to Duncan’s own Lisa Scott. Lisa generously provided a permanent easement on her property to build the put-in. This project would not have been possible without her generous gift. 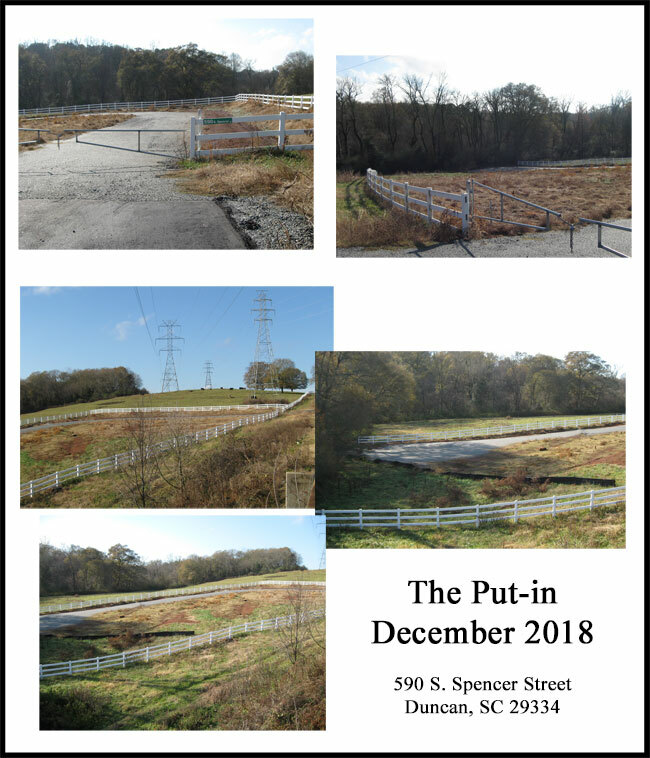 The Spartanburg County Council was responsible for a grant to the Tyger River Foundation which vastly accelerated the time frame for this project. 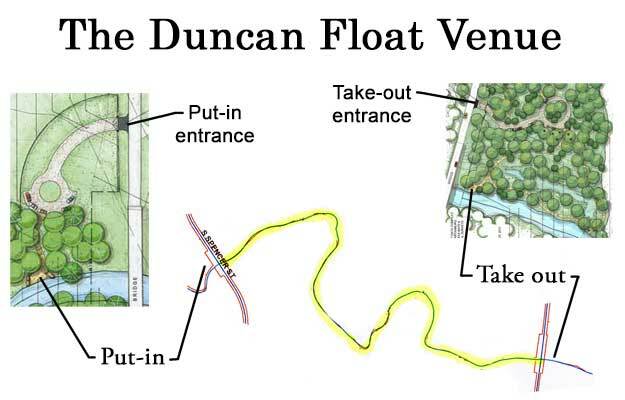 The current status of the Duncan Float (4/2019) is that the put-in and the take-outs are almost complete. All that remains are some signs and some minor landscaping. The pictures shown here are of the put-in. It is a bit difficult to see in the pictures so it is suggested to simply drive by to see the progress for yourself. The main task that has to be accomplished to make this an enjoyable float for all is to clear the river of obstacles. The link below contains a few things we have learned. Click here for a summary of some of the things we have learned about removing wood from a river. If you would like to volunteer to help please call any of the phone numbers listed below. If you can lug wood out of a river, run a chainsaw, measure water temperature, take water level readings or cook the food to feed volunteers your skills can be utilized. 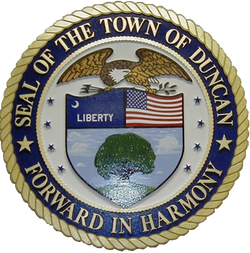 The slogan for the Duncan Float is “Floating Forward in Harmony.” If you examine the Duncan Town Seal shown below you will understand where this slogan comes from. As you experience this venue we believe you will experience harmony with nature and hopefully harmony with others as well.